Driven by the ancient Norse saga about mythical female elite warriors sworn to protect the realms of Asgard, Valkyrie is the December 2018 release by Elk Studios utilizing familiar setting with 5 reels, 4 rows and 1024 ways to win. The game is equipped with Wilds, Scatters, Free Spins, and 2 interesting interactive Bonus games finally leading to the jackpot of 400 coins. 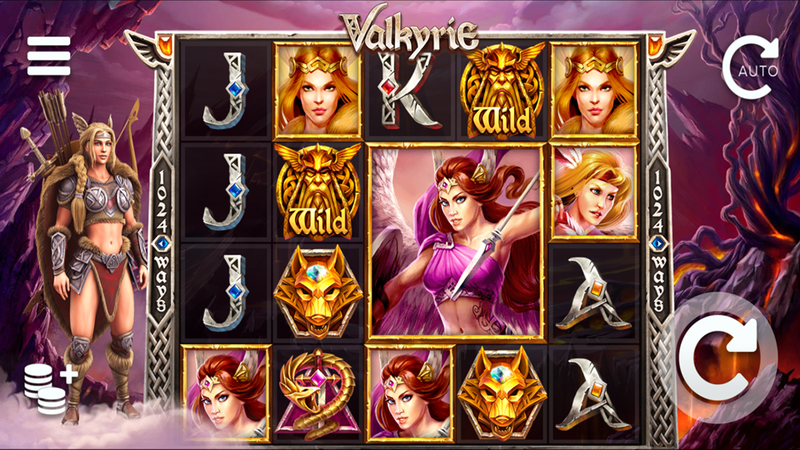 Read the Valkyrie slot review and learn how to win the main prize. Tired of reading? See the Valkyrie screenshots below and then claim one of the bonus offers of our recommended casinos to play for free or real! First of all, players have a choice between the Valkyrie free play and real money modes, while both options include the Elk Studios’ Betting Strategy feature. What does it mean for you? Depending on your experience and affinities, pick Optimizer, Leveller, Booster or Jumper and let the game adjust the number of coins and bet size according to a predefined pattern. Moreover, presuming your bankroll is solid enough, use the Autoplay mode and spin the reels for 10 to 100 times without being interrupted. In terms of the gameplay, this is a standard slot machine that pays from the left for a combination of 3 or more symbols of the same kind. Bear in mind that the total bet value ranges from €0.20 to €100 and each spin costs 100 coins and there is a maximum of 12 levels. The Allfather Odin serves as the Wild and may replace all other symbols except the Scatter, which is needed to activate the Valkyrie Free Spins. All 4 Valkyrie symbols have a much higher rating than any other and may produce 60 to 400 coins for combinations of 3 to 5 of a kind. Various themed icons taken from the Viking culture such as gauntlet or sword bring 10 to 200 coins for the same number of collected symbols. On the other side, try not to be too much disappointed when the rune-like playing cards from Tens to Aces appear on the screen since they produce the smallest possible amount of cash. Collect 3, 4 or 5 Scatters and activate 5, 7 or 100 Valhalla Free Spins with at least 1, 2 or 4 guaranteed spin featuring a randomly-chosen Valkyrie Bonus Feature, respectively. Prospective winners get to enjoy the Sword of Destiny that turns regular symbols on the reels 2, 3 and 4 into Wilds; Shield of Chance where all shield icons turn into Wilds; and Arrow of Fortune where flaming arrows generate 2x2, 2x3 or 3x3 field with icons of the same kind helping you form more winning combinations. Also, remember that extra Scatters grant additional spins and bonus features. 3. What is the RTP factor of Valkyrie? According to the official info released by Elk Studios, RTP stands at 96.30%, which was confirmed in the Valkyrie recension. This is an action-packed and visually-appealing game that also bears an interesting history lesson. Using the Valkyrie tips received in this tutorial, you will be surely able to defend Odin and collect a massive amount of coins along the way. Just remember the casino still has a slight advantage.